on the left side of the screen click here. This land belonged to Henry Johnson in the early 1800s. This is where Barlett and Delphia's home was located in 1920 (Hampton, TN ). This is NOT their home. Who are Henry and Mary's parents and where are they from? 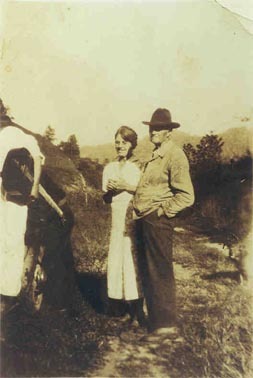 Epsie Cordelia Goforth - She married Jae M. Depew (spelling?) and died in Plaino, TX. Roby Leander Goforth - born January 25, 1878 in TN, died 1932 in Lorain, Ohio. Nora Elizabeth Goforth - born September 23, 1885 in TN, died September 21, 1904 in Hampton, Carter Co., TN. Roby Johnson and his sisters, Sarah and Charity. 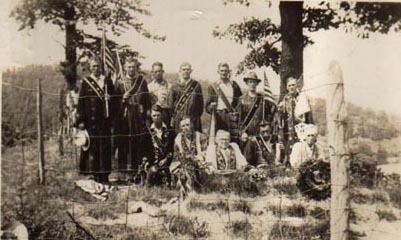 Roby's funeral conducted by the Odd Fellows. John "Roby" Johnson born 1860 probably in Watauga County, NC, died December 08, 1941 in Thelma, KY.
Delphia Johnson born March 02, 1908 in WV, died April 15, 1985. She married Linzie Travis born July 09, 1905, died July 29, 1987. They are both buried in the Gambill family Cemetery in Thelma, KY.
Anna Lee Johnson married Daniel "Dan" James Gambill. Floyd L. Johnson born May 17, 1894 in Wichita, KS, died September 09, 1962 in Wichita, KS. 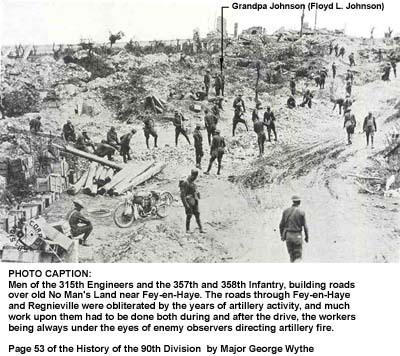 He served in WWI with the American Expeditionary Force, 1st Army, 90th Division, Company F of the 357 Infantry. He participated in the St. Mihiel offensive and the Meuse-Argonne battle. "It's the little nuggets ... the ones that were the hardest to find that mean the most! To others it might appear as simply another entry in your records. But that one little tidbit of information might have taken years to find ... AND it opened the door to a past generations. "